This is a telegram sent to Daniel Mascioli informing him of Leopoldo (Leo) Mascioli's and Antonio (Tony) Mascioli's releases from internment camp. Typewritten, one page. Daniel was Leo's and Tony's nephew. The telegraph company is listed as Temiskaming and northern Ontario Railway's telegraph - operated by the Ontario Government Commission. The date on it is February 14th, 1941 at 9:51 a.m. 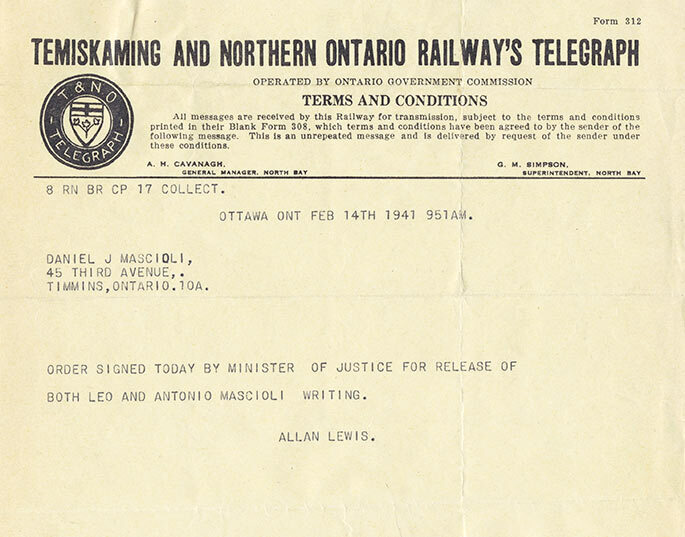 The message reads: "Order signed today by Minister of Justice for Release of both Leo and Antonio Mascioli. Writing. Allan Lewis." The Mascioli brothers were both interned during World War II at Camp Petawawa.